Invite customers to an interactive customer portal for viewing invoices, statements, sharing files and making payments. Batch actions are currently only applied to a maximum of one page at a time, please contact us via chat or at support@armatic.com to send invitations as well as apply any other changes to more than a page of customers/invoices at a time. If more than one customer contact would like access to the portal, you can provide each with their own credentials vs forcing them to share a password. To do so, select "Edit" from the customer details page, then scroll down to the contacts section. 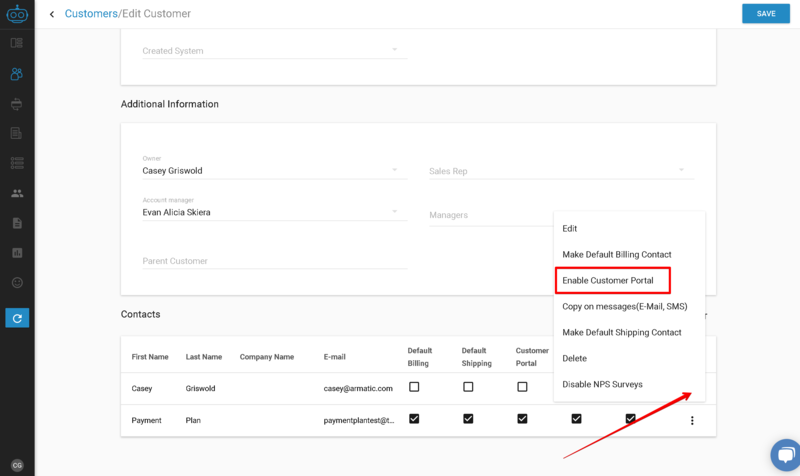 Add a new contact if needed, then select the menu next to the contact them the option to "Enable Customer Portal". You can send this contact a invitation by selecting the contact menu again, then "Send Invitation" as well as the "Send Invitation" option from the main customer details page. Your customer portal is located on "sub domain" that you selected in your Company Profile. It will be (sub domain).armatic.com. For the example account below, their customer portal is located at hooli.armatic.com. From your Customer Portal login page, customers can "Request Access" to their portal. After selecting the request access link, they will be prompted to enter their email address. If the email address they enter, matches a customer in your account, they will automatically receive an invitation to the customer portal by email.